Does Rice Powder Cause Acne? Many mineral makeup companies in their advertising postulate that use of rice starch and other food starches in traditional makeup or mineral makeup like Oat, Soy, Arrowroot, and Corn, to name a few, feed or support bacteria and stimulate its growth on the face. These statements are completely false and misleading and these "internet myths" may be the popular belief, but they are not supported by scientific evidence. Acne is caused by a buildup of sebum in the pore that is not functioning properly, then it gets clogged and the usually harmless bacteria which is naturally occurring in your skins' pores begins to multiply, which are called Propionibacterium Acnes. The bacteria take its' food source from this sebum buildup, not from rice powder or any other ingredient applied to your face. As the pore remains clogged the bacteria multiply which in turn releases chemical substances followed by intense inflammation, which then gives birth to the latest pimple on your face. If not tended to, the acne can grow to become cystic. 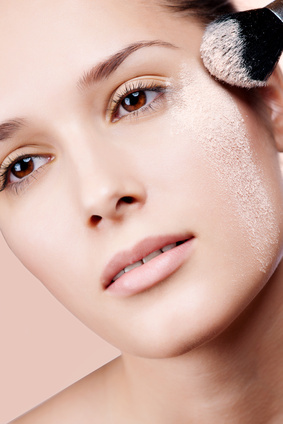 Getting and keeping the pore unclogged is the single most important factor of all. Now once we get the facts straight on ingredients and how they relate to acne issues, it is an ever evolving nature of the internet to recycle the next batch of overblown articles about certain ingredients. For instance; manufacturing modified cosmetic grade rice powder and other food starches means removal of contaminants (ie, lead, arsenic, trace metals, etc. ), moisture content and more for making the powder hygienic. This type of rice powder is designed for use in the cosmetics industry in order to achieve a desired texture or consistency or slip and silken feel such as in baby powders, spray powders, pressed powders, moisturizers, bath soaps, facial masks, with the list being endless. Raw grade food starches you can find at your local grocer are never used in cosmetics and tend to be gritty in texture or contain a lot of moisture. Rice starch or oat starch (flour) are excellent in their raw, natural state for use in poultices, masques and gentle exfoliation of the skin. These will not possess the fine silken feel and slip we enjoy from the modified rice powder and other food starches. Modified food starches were developed in order to create greater stability, free from bacteria and molds, extend shelf life and create a more free flowing powder giving a better consistency in cosmetics. Armed with this information use these ingredients in whatever skin care product you prefer with confidence. Rice Powder is still used today in Ayurveda (Ancient Holistic Medicine from India) in poultices to bring fast, soothing relief to inflamed or bleeding pimples or skin ulcerations. It also has a cooling effect on the skin when applied with the mineral makeup moist method of application of one of our mineral veils containing this key ingredient. It is also the reason why it is formulated into all of our mineral foundations and other cosmetic formulas, and why it is perfect for those suffering from acne and rosacea. Rice Powder is one of the most non irritating ingredients used for many skin issues. Plus it never dries out the skin no matter your skin type. Another reason we love this ingredient is the fact that rosacea sufferers claim ours is the only mineral makeup foundation they can use, and it is based on the attributes of this ingredients' soothing and healing properties. Other women rave about its performance in our cosmetics as they have clearly made a marked improvement to the look and feel of their skin. UPDATE: Opponents to using this ingredient on the face or in mineral makeup were everywhere on the internet. However, Katherine knew that rice powder was a terrific ingredient from the inception of her brand more than 10 years ago. Since she first reported the science in her blog back in 2007 about the actual cause of acne and rice powder never being a factor, the consensus among beauty bloggers and makeup gurus has since changed across the internet. This included Paula Begoun before she began her own cosmetic line. She once defined rice powder as an ingredient that contributed to acne on the face as a food source. It seems that once Katherine presented the scientific research and it refuted the bogus claims that rice powder used in mineral makeup increased acne issues, more and more opponents to this otherwise safe and gentle ingredient have done an about face, including Paula B. It is a good day when through science, you can get others to see the facts and report them accurately instead of perpetuating the acne myth about this wonderful healing ingredient which actually works wonders for people with acne. There are still some brands that wish to claim that using rice powder in mineral makeup will also help support and feed bacteria in a mineral makeup jar, especially when it is stored in a bathroom or moisture is used to apply it. Of course this is not the actual science of how bacteria grows or propagates, so we will show you the truth in relation to bacterial growth within a mineral makeup jar.